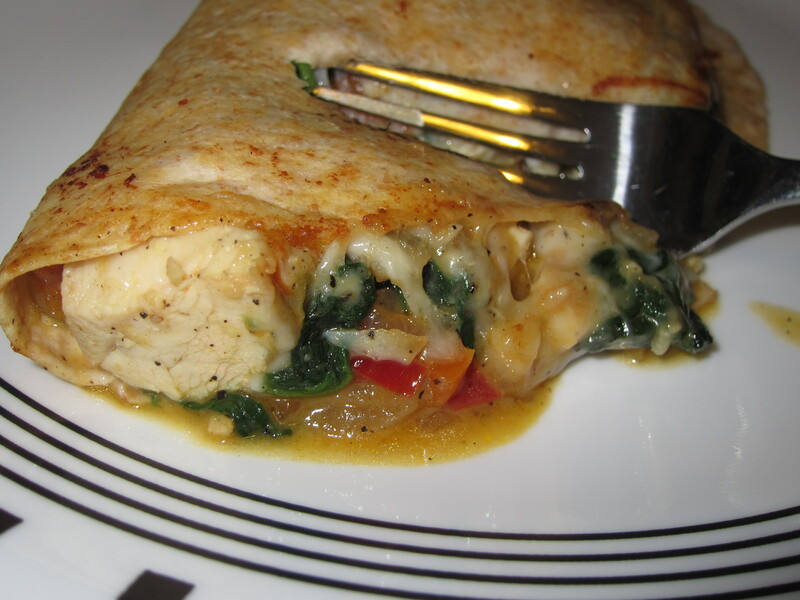 A few months ago I posted these amazing Pizza Quesadillas and I knew it wouldn’t be too long before I was posting about these amazing Chicken and Spinach Quesadillas. This is one of my go to recipes when I have left over chicken breast sitting in the fridge from dinner the night before. These seriously are some of the best quesadillas I make! I know a lot of restaurants have the “stand-by” standard chicken quesadillas on the menu, but these are so much better. The vegetables get nice and tender, the chicken stays juicy, and the cheese binds everything together. Sometimes when I have some extra corn and/or black beans laying around I will toss them in the with the vegetables right before I add the chicken to the mixture — just to give it an other southwestern flavor kick. I cannot wait till the next time I have leftover chicken sitting around so I can make another one of these for lunch or dinner! Before you begin, make sure your chicken has been precooked and is chopped! In a large skillet over medium heat, melt 2 tablespoons of the butter and sauté the peppers and onions together until they are nice and tender, approximately 5-7 minutes. As the vegetables sauté lightly season them with salt and pepper. Add the chopped garlic and sauté for 1-2 minutes until you can smell the garlic. Add the spinach to the pan and toss together, sauté the spinach until it is cooked, which will take 2-3 minutes. If there is no butter left in the pan to cook the spinach and the mixture seems dry, add the remaining tablespoon of butter. Once the spinach is cooked add the chicken to the mixture, toss to combine and set aside. Heat a clean large skillet over medium heat. Lightly butter one side of the tortilla or spray the pan with non-stick cooking spray. On the opposite side of the tortilla of the butter, spread 1/4 cup of the Italian Shredded Cheese and half of the chicken and spinach mixture. Fold the tortilla over and place it in the pan. Once the tortilla is browned flip it over and brown on the other side. It will take approximately 4-6 minutes per side. Remove the quesadilla from the skillet and allow it to sit for a few minutes before serving!